Last week, Aaron Ross had an insightful piece for Reuters about Moise Katumbi's upcoming run for the presidency in the Congo. In the article, he mentioned that Katumbi––or a company now managed by his wife, to be more precise––had employed a lobbying firm in Washington in what appears to be an effort to help with his campaign. A closer look at lobbying disclosure forms shows that Katumbi is far from alone in these efforts to curry favor in Washington. Two lobbying companies are currently working for the Congolese government, and US government officials report that at least one other group has been lobbying them about the Congo. Mining Company of Katanga (MCK), a company founded by Moise Katumbi and now managed by his wife Karyn, initially employed Akin, Gump, Strauss, Hauer & Feld in 2013 to help secure the opening of a US consulate in Lubumbashi and to press for USAID to send corn to Katanga. This disclosure form details the nature of this arrangement and suggests that Katumbi paid $350,000 to retain the firm for the period of one year. It does not appear, however, that the lobbyists did much traditional lobbying. According to the Foreign Agents Registration Act archives, which compiles visits by lobbyists to government employees for foreign entities, the company only had one meeting for MCK in the second half of 2014. That was with Congressman Ed Royce, chair of the Foreign Affairs Committee in the House of Representatives. While that meeting was about the consulate and corn supplies, the next meetings, which took place six months later, were not. Starting in April 2014, and still within the initial contract period (which was supposed to only concern the consulate and corn), the lobbyists had eleven meetings in a period of several months about "the DRC presidential electoral process." Apparently, Katumbi has had his eye on the presidency for some time. This year, that activity intensified. The contract with Akin and Gump was apparently renewed, and lobbyists had 240 meetings, emails, and phone calls with various officials about the presidential elections. Here's the list; most of the meetings and correspondance was with legislative aides and staff, although there have also been exchanges with State Deptartment officials and NGOs. As the Reuters article indicates, and as US officials have confirmed to me, it is clear that MCK is pushing for US action to guarantee Kabila's exit in 2016. In private meetings, Katumbi has also obliquely, but clearly, sought to secure US support for his own bid. The Glover Park Group is working for a Congolese company called LN Communications, which is in turn working for the Congolese government. The contract stipulates that Glover Park will help the Congolese government with its commercial relations with the US government for one year, starting April 1, 2015, in return for $540,000. In addition, US government officials have told me that private companies, including a group belonging to Dan Gertler, have also retained lobbyists in DC. Will this sort of lobbying make a difference? The United States government will not endorse Katumbi, and even without MCK's prodding it was pushing pretty hard for Kabila to stand down in 2016. As for the Congolese government, the lobbying efforts in Washington, DC were not as effective as the persistent diplomacy like the kind carried out by the Rwandan government during the war (1998-2003). And it doesn't appear that the US government, especially during this period, was particularly favorable to the authorities in Kinshasa. One can also wonder about the cost. For comparison, in 2013 (the last year where I can find data on the execution of the budget), the operating budget for the police of North and South Kivu was around $158,000, for the Hôpital Général de Kinshasa around $196,000, for Congolese veterans around $153,000. Nonetheless, history has been a potent teacher for Congolese. 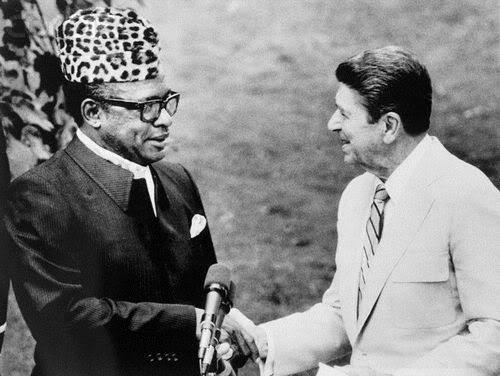 The US government was for many years a big player in Mobutu's Zaire, and even more recently antipathy against Etienne Tshisekedi among foreign officials––including in MONUSCO and the US––contributed to the international response after the rigged 2011 elections. Thank you Sir for your insightful article. I find it very interesting and also sad for the Congolese people, my people to have officials that are more concerned in doing business than actually ruling this country. As a Congolese, I really hope that the next president that will come will strengthen the Comgolese institutions that will first serve the Country and its people. After reading this article, Katumbi is definitely not fit for the post. I really hope that we Congolese will determine ourselves who we want as our leaders, no criminals, Rebels or corrupt politicians anymore.